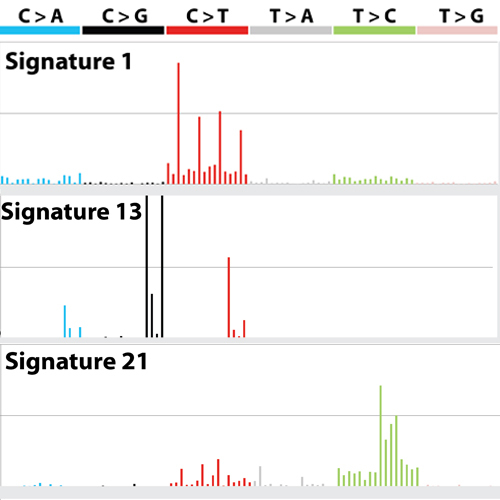 What does a mutational signature look like? How will we do the research? In the Mutographs project, we are investigating signatures that are left in DNA by lifestyle and environmental factors. These signatures are formed of changes to DNA known as “mutations”, which is why we call them “mutational signatures”. But what does a mutational signature look like? What information can these signatures tell us? Read on to find out. Our DNA is made up of chemicals known as ‘bases’. Although a person’s DNA contains billions of these bases, there are actually only four types. These are called A, G, T and C. The precise order of these four bases in our DNA creates the instructions needed to make us. About 99.9% of our DNA is the same as everyone else’s, but that 0.01% difference is enough to give us our unique features. There are special computer programmes that can analyse and compare DNA from lots of different people to identify where some of these DNA differences occur. In some cases, these differences can be linked to the development of disease. For example, tobacco smoke and UV light can damage DNA by causing one base to change to another one. This means the DNA instructions might stop making sense. It’s a little like if the C in the sentence ”I fed the Cat” was swapped for a g – the sentence becomes “I fed the Gat” and doesn’t make sense anymore! If these changes happen in important areas of DNA, they can lead to cancer. The colours show the different types of base changes that can happen. For example blue lines mean there is an A where there would normally be a C, labelled as C > A. Grey lines mean there is an A where there should be a T, labelled as T > A. The taller the line is, the more often this change appears in the DNA. There are lots of different lines for each change. This is because the programme also accounts for the bases that are either side of the changed one. For example, with a C > T change, an ACA sequence will become ATA, and ACT will become ATT. These neighbouring bases can make a difference to what effect the change has. Looking at three bases together also makes the programme more sensitive and allows changes to be spotted more easily. Certain chemicals and factors make very specific changes to DNA. These changes produce very distinctive signatures that scientists can recognise. For example, Signature 1 (see above) has a lot of C bases changed to T bases. 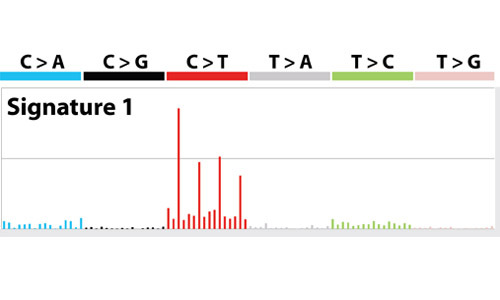 Research has shown that signature 1 is associated with a biological process known as deamination, which can affect the structure of the C base. Now look at Signature 1 compared to two others – Signature 13 and Signature 21. They all look very different! This is because the signatures are caused by factors that affect the DNA in different ways. Signature 13 appears when lots of C bases are changed to G bases. It is associated with the action of a group of proteins called APOBECs. Signature 21 is caused by DNA not repairing itself properly after damage, and you can see that it involves lots of T bases being changed to C bases. There are around 50 different signatures that have been discovered so far. Careful investigation has uncovered the factors that create many of these signatures. These include tobacco, UV light and a toxic chemical found in some fungi called aflatoxin. We still don’t know the causes of many of these signatures; however many of them are associated with a higher risk of developing cancer. A priority for the Mutographs project is to identify the culprits behind the mutational signatures that are linked to cancer development. 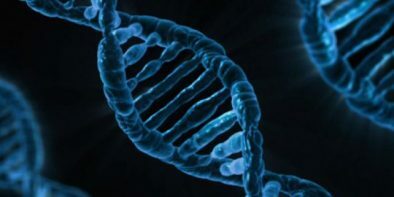 This will help us to understand more about what lifestyle and environmental factors can change DNA and how these changes are linked to cancer. How can mini-organs help us to understand cancer? If you are a researcher looking for data on the Mutographs project, please see here. Want to talk about cancer? If you would like to speak to a nurse about cancer, please call Cancer Research UK on 0808 800 4040 or visit the ‘Ask our nurses‘ website. If you are looking for more information about the Mutographs project, please email contact@mutographs.org.